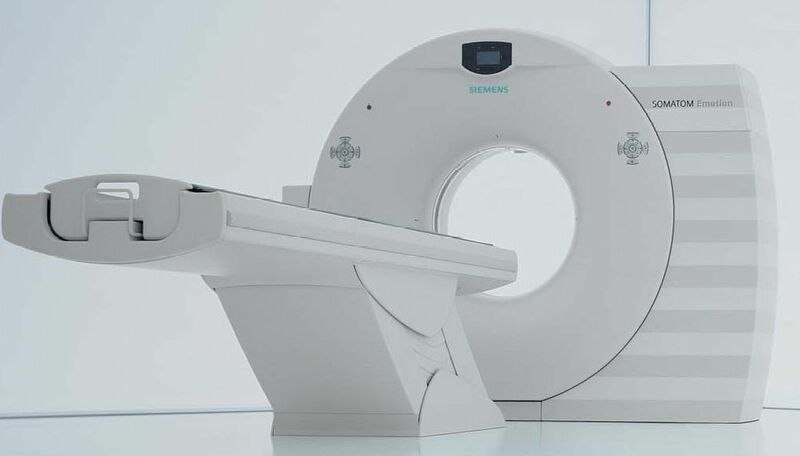 The Siemens SOMATOM Emotion 16 mobile CT scanner is an incredibly compact system, requiring only 18 square meters of floor space, and despite its size, the Emotion 16 packs some of the leading CT imaging technologies to provide clearer images, faster scan times, and increased patient comfort. With regards to its imaging capabilities, the Emotion 16 CT scanner offers exceptional routine spatial and contrast resolution. While acquiring the images, this CT scanner uses the SureView dedicated spiral image reconstruction algorithm, which automatically selects the necessary pitch to achieve optimal coverage and scan times defined by the user. This technology also maintains selected slice thickness and image quality. The SOMATOM Emotion 16 mobile CT also includes the acclaimed Fast Care technology with features such as Fast Planning and Fast Spine. Moreover, the WorkStream 4D feature virtually eliminates the need for manual reconstruction. In general, this CT scanner reconstructs images at 16 images per second. Other beneficial imaging features include its a 50cm scan field, a patient table that can hold patients up to 440 pounds, and a 70cm aperture. Lastly, the SOMATOM Emotion 16 scanner optimizes patient safety with its DoseMAP dose management system, allowing for comprehensive dose reporting, protection, and management.